Offering a restaurant and free Wi-Fi internet access, Aero Hotel is located in Issy-les-Moulineaux, just 10 km from the centre of Paris. Corentin Celton Metro Station is just 450 metres away. Guest rooms here will provide you with a flat-screen TV and a work desk. Featuring a bath or shower, private bathrooms also come with free toiletries. Breakfast is available every morning at Aero Hotel and drinks can be enjoyed in the bar. 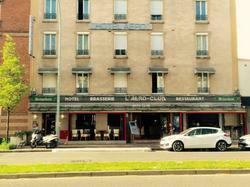 The hotel is 400 metres from Mairie d'Issy and 1.5 km from Porte de Versailles. Charles De Gaulle Airport is 28 km away and the property is 17 km from the Palace of Versailles. Rooms include a flat-screen TV, a desk and a private bathroom.